AC Milan goalkeeper Pepe Reina urged his team to go into their Serie A clash with Juventus on Sunday with no fear. Gennaro Gattuso's team face a huge test when they welcome the league leaders to San Siro, although Milan have strung together a four-match unbeaten run after their 1-1 draw with Real Betis on Thursday. Reina recognised Juve were a strong outfit, but said his side had nothing to be scared about when facing Massimiliano Allegri's men. "With all humility and respect, we're aware they are strong, but we face them with no fear, there is so much trust," he told Sky Sport Italia. "We play with a full San Siro and we have to do our best to get three points." Juventus are already six points clear atop Serie A after winning 10 of their opening 11 matches. 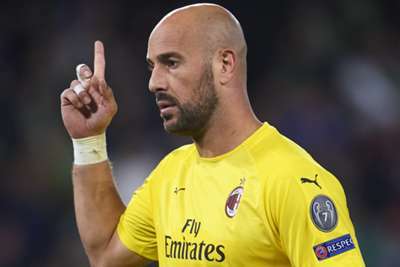 Milan have jumped into fourth on the back of three straight league wins and Reina feels they are much-improved after getting through a tough period. "In difficult moments, you have to get out of it to become even stronger," he said. "Now, we must continue like this."